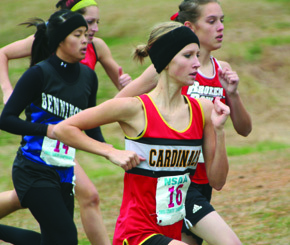 Boone Central’s cross country runners capped the 2008 season with one of the most impressive performances in school history at the annual NSAA championships October 24. Competing against Nebraska’s best Class C harriers in cold, wet weather conditions over the challenging Kearney Country Club course, junior Kevin Carder and senior Halie Smith scored top five individual medals. The Boone Central boys team garnered a solid sixth place finish. “Friday’s state meet may just have been the best performance by a Boone Central cross country team ever! There was not a single disappointment,” exclaimed Cardinal Coach Tom Dickey. 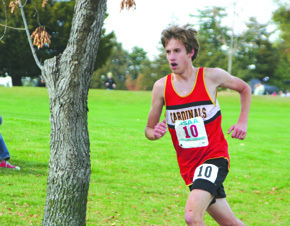 Carder continued his 2008 meet-to-meet improvement at Kearney, peaking at just the right time. The lanky junior traversed the hilly course in a time of 16:58.3, placing third behind only Norfolk Catholic’s Jarren Heng and Grant Aden of Syracuse. Smith culminated her breakout season, which included last week’s district championship, with a 16:12.5 clocking to place fifth and was within 13 seconds of the race runner-up. “I was so proud of those two – they had a lot of pressure to do well, but just ignored it and really ran their hearts out!” Dickey commented. “We had run against some of the best in Class C, but hadn’t seen anyone out of our area and didn’t know how tough some of the individuals would be. 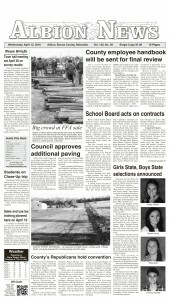 The Boone Central boys team also saved its best for last in 2008. After a somewhat surprising third-place district finish to qualify for the state competition, the Cards took sixth Friday. Individually, junior Bryce Schilousky placed 48thth (18:39.1), sophomore Otto Pankrath 49th (18:39.3), soph Jacob Lindgren 56th (18:48.9), soph Cody Bryant 83rd (19:52.2) and senior Drew Bonge 90th (22:04.9). “I’m so pleased with the entire season. We’ve seen a change with the kids in becoming a real team of runners,” Dickey added. “They’ve bought into the program and want it to continue.